Aproximacionesis an essential program in developing an adequate appreciation of Spanish and Spanish-American literature. It provides native and non-native speakers with the opportunity to grasp the various levels of meaning of each reading. Additionally, it helps students to acquire the technical vocabulary to describe and debate literary issues appropriately. 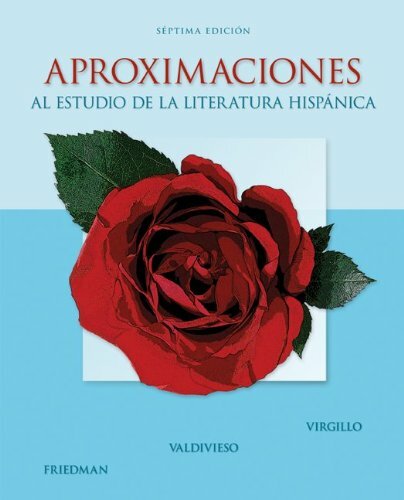 The text devotes a unit to each of the literary genres: narrativa, poesía, drama, and ensayo. All readings are followed by three sets of practical activities. Latin American Literature with Naomi E. Lindstrom (Columbus University of Missouri Press, 1985), and Blbliografï¿½a analï¿½tico-descritiva de Henriqueta Lisboa (Rio de Janeiro: Josï¿½ Olympia Editora, 1992). He also authored and co-authored numerous articles and essays on nineteenth- and twentieth-century Spanish, Spanish-American, and Brazilian literature. In addition, he was a contributor to the Suplemento literï¿½rio do Minas Gerais (Belo Horizonte, MG, Brazil). The recipient of several nominations for excellence in teaching, he has been cited by the Italian Ministry of Education for his career-long development of and contributions to the promotion of Italian studies in the United States. He is currently researching a new book on Hispanic civilization. boba (performed by Vanderbilt University Theatre as part of its 2006-2007 season). He has received grants from the National Endowment for the Humanities, the Fulbright Scholar Program, and the National Humanities Center. He is editor of the Bulletin of the Comediantes and has served as president of the Cervantes Society of America. Nominated by Brigham Young University, he was selected for the Sigma Delta Pi "Orden de Don Quijote" Award in 2005. The recipient of teaching awards at Arizona State University and Indiana University, he was presented the Jeffrey Nordhaus Award for Excellence in Undergraduate Teaching at Vanderbilt in 2006.
silenciado, Negocios y comunicaciones, and co-author of Studia Hispanica Medievalia, La mujer hispana en el mundo: sus triunfos y sus retos, Voces y textos literarios del Ecuador, and most recently Presencia de la mujer hispana (2004), and Madrid en la literatura y las artes (2006). She is a founding-member and past president of the Asociaciï¿½n de Literatura Femenina Hispï¿½nica, vice-president of the Asociaciï¿½n Hispï¿½nica de Humanidades, senior bibliographer of the Modern Language Association, and recently elected vice-president of Spanish Professionals in America. She continues to teach at Arizona State University. In 1980 she was the recipient of the Dean’s Award for excellence in teaching; in 2002 she received the Outstanding Faculty Committee to Teaching and Learning Award, and in 2007 has been awarded the title of Honors Disciplinary Faculty. "Lo que sucedi a un mozo que cas con una muchacha de muy mal carcter"
"No oyes ladrar los perros"
"El hombre que aprendi a ladrar""El Otro Yo"
"El paraso imperfecto""La rana que quera ser Rana autntica""El mono que quiso ser escritor satrico"
"La mujer que llegaba a las seis"
"El Enamorado y la Muerte""Romance del conde Arnaldos"
"Vivo sin vivir en m""Nada te turbe"
"Llama de amor viva""Noche oscura"
"A su retrato""A una rosa"
"Si ves un monte de espumas""Dos patrias"
"Los maderos de San Juan""Nocturno III"
"El cisne""Cancin de otoo en primavera"
"La pregunta""Si T me dices "Ven!"" Proverbios y cantares: "XXIX""La saeta"
"Yo no soy yo""Vino, primero, pura"
"Yuntas""El momento ms grave de la vida"
"Cancin de jinete""Prendimiento de Antoito el Camborio en el camino de Sevilla"
"Sale caro ser poeta""Mis mejores poemas"
"Y las madres, qu opinan?" "La autenticidad de la mujer en el arte"